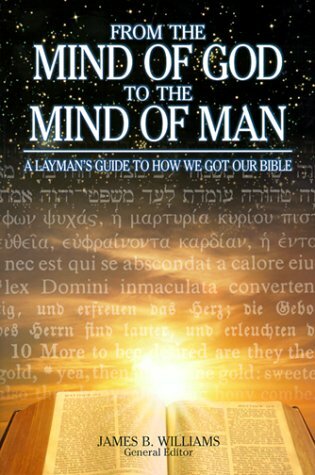 James B. Williams, General Editor, From the Mind of God to the Mind of Man: A Layman’s Guide to How We Got Our Bible (Ambassador-Emerald International, 1999): 231 pp. This book is a collection of articles published in response to controversy created by KJV-Only advocates within American fundamentalist Baptist circles. It originated in a gathering of pastors in 1998 who formed “The Committee on the Bible’s Text and Translation.” The articles are written by members of this committee and other invited authors and academics from the fundamentalist community. James B. Williams, “Introduction: The Issue We Face” (pp. 1-11). This article outlines the problem. It describes “the translation controversy” as the fourth great fundamentalist controversy after, (1) liberalism versus orthodoxy; (2) Neo-evangelicalism; and (3) the charismatic movement. Williams charges KJV extremists with creating unnecessary dissension in fundamentalist ranks. Randolph Shaylor, “Our Final Authority: Revelation, Inspiration, Inerrancy, Infallibility, and Authority of the Bible” (pp. 13-29). Shaylor presents an overview of the general, conservative view of the nature and authority of Scripture. He embraces the B. B. Warfield view of the inerrancy of the “autographs.” “Copies of these writings retain the quality of inspiration to the degree that they are accurate representations of what God gave in the autographs” (p. 22). Paul W. Downey, “Canonization and Apocrypha” (pp. 31-64). This article presents a general survey of the how the canonical books came to be recognized and accepted with special attention to how the Apocrypha was rejected by Protestants. (1) Regarding the Apocrypha. In an apparent effort to score points in the “translation controversy” Downey notes that the 1611 AV included the Apocrypha. He even states that in so doing the AV “had followed the Council of Trent, not the Reformers, in the treatment of the Apocrypha” (p. 45). This statement is more than a little misleading. The AV translators were staunch Protestants and included several notable Puritans. They were hardly sympathetic to Rome. A clear confessional statement on the Apocrypha was not made until the Westminster Confession of 1647, years after the AV was first printed. By printing the Apocrypha as a supplement to the Old and New Testaments, the AV was simply following common Protestant practice of the times. Note: The original Geneva Bible (1560) also included the Apocrypha until the 1599 edition. (2) Regarding Baptist confessions. Downey provides a discussion on confessional statements regarding canon, noting that the Westminster Confession provided “the most detailed statement on the Reformed church’s approach to Scripture.” He then notes, “Later Baptist confessions appeared that stated that the Word of God in the Old and New Testaments was the only rule of faith and obedience (1644 Confession, Charlestown Confession of 1665, Philadelphia Confession of 1742, etc. ), but none gave the careful definition and description the Westminster Confession had provided” (p. 61). This statement is both curious and dubious. First, by “the 1644 Confession” we assume Downey is referring to the First London Baptist Confession of Faith (1644). Less clear is his reference to the “Charlestown Confession of 1665.” Does he mean to refer to the confession adopted by the Baptist Church at Kittery, Maine in 1682 (which relocated to Charleston, South Carolina in 1696)? This confession was then adopted by the Charleston Association of Baptist Churches in 1767 and known as “The Charleston Confession” (see H. Rondel Rumburg, ed. Some Southern Documents of the People Called Baptists [Society for Biblical and Southern Studies, 1995]). This confession, however, was based on the Second London Confession of Faith (1689) which followed the Westminster Confession and has the same article one on Scripture. Next, he makes reference to the “Philadelphia Confession of Faith of 1742.” Like the Charleston Confession, this one was also based on the Second London Baptist Confession (1689) which followed the Westminster Confession and had the same statement on Scripture in its first article (see William L. Lumpkin, Baptist Confessions of Faith [Judson Press, 1969]). This leads to a glaring problem with Downey’s statement that no Baptist confessions “gave the careful definition and description the Westminster Confession had provided” (p. 61). He seems to be unaware of the existence and influence of the Second London Baptist Confession of Faith (1689) which followed the first article of the Westminster Confession of Faith on the doctrine of Scripture verbatim, including its definition of the sixty-six canonical books, its rejection of the Apocrypha as canonical, and it affirmation of the doctrine of the divine preservation of Scripture. Mark Minnick, “Let’s Meet the Manuscripts” (pp. 65-98). Minnick presents a basic overview for a popular audience of how textual critics analyze and evaluate Biblical manuscripts. He sees the goal of text criticism as the process of comparing “thousands of extant manuscripts in an effort to confirm, in so far as is possible, the precise wording of the autographa” (p. 71). He concludes that “God sometimes uses unorthodox men to do the textual criticism underlying entirely acceptable translations” (p. 79). At the close of the article, Minnick also draws citations from conservative stalwarts like Spurgeon, Dabney, and even the dispensationalist Schofield to argue that they shared his views on textual criticism. John E. Ashbrook, “The History of the Textus Receptus” (pp. 99-108). Ashbrook traces the development of the printed Textus Receptus of the Greek NT, focusing on Erasmus. He concludes that the TR is “the Model T Ford of the New Testament text,” a “great triumph in the world of transportation,” but “only a first step into the present automotive world” (p. 106). John K. Hutcheson, Sr., “English Translations Before the King James Version” (pp. 109-124). This article traces the history of various English translations preceding the KJV concluding with the challenge that each generation should have “a fresh English translation of the Bible” (p. 123). John C. Mincey, “The Making of the King James Version” (pp. 129-145). Mincey provides a succinct and helpful summary of the historical setting in which the KJV was undertaken and the process followed by the translators and publishers. Much attention is given the KJV preface “The Translator to the Reader” (thought to have been written by Miles Smith). Mincy concludes that this preface undermines any notion of a KJV-Only perspective. The committee on the Bible’s text and translation, “The Changing King James Version” (pp. 147-167). This chapter traces various editions and modifications made to the KJV after 1611, culminating in the 1769 Benjamin Blayney edition that is primarily in use today. It concludes with a discussion of Matthew 5:18 and Jesus’ statement that not one “jot” or “tittle” would pass away from the word. William H. Smallman, “Printed Greek Texts” (pp. 169-184). This article offers a survey of printed Greek texts culminating in the modern Greek text represented in the Nestle-Aland 27th ed. and the United Bible Society 4th ed. It also references printed editions of the Texus Receptus and the Majority Text. Smallman sees a basic divide between two families (modern critical Greek text advocates on one side and TR/Majority text advocates on the other). He concludes that “the notion of a ‘standard Greek text’ is more a convenience than a necessity,” since “none of the differences change any Christian doctrines” (p. 182). J. Drew Conley, “English Versions Since 1880” (pp. 185-209). Conley offers a survey of various English translations from the Revised Versions (NT-1881) to the NET Bible (NT-1998). There are some interesting tidbits along the way (e.g., the ASV  was the most cited version in The Fundamentals). Conley firmly opposes paraphrases, saying Peterson “has taken reckless liberties” in The Message. Despite the fact that the book has been updated and had its fifth printing in 2008, this chapter does not discuss more recent translations like the ESV and the HCSB. Keith E. Gephart, “Conclusion: The Response to These Facts” (pp. 211-218). Gephart concludes, “As always, Fundamentalism’s greatest difficulties are caused by those within its own ranks who by some actions, statements, or doctrinal positions bring embarrassment and unnecessary discord” (p. 211). He makes a plea for toleration, saying, “it is time for unbibical and unchristian judgmentalism in this department to disappear” (pp. 216-217). I found this book to be interesting and mostly reliable (see, however, the critique of Downey’s chapter). It provides a window of insight into how conservative, fundamentalist pastors, scholars, and churches are being affected by modern translation controversies. I think this book will go a long way toward disabusing laymen (the purported intended audience) of the intellectual, historical, and theological problems with a simplistic KJV-Only mindset. I think the book is less successful, however, in responding to more sophisticated questions about issues related both to translation philosophy, the underlying texts from which translation are made, and downgrade tendencies that have resulted from the introduction of modern texts and translations. For one thing, the authors have accepted the neo-evangelical construal of the inerrancy of the original autographs (a la Warfield, Chicago Statement on Biblical Inerrancy, etc.). There is little discussion of the Reformed doctrine of the divine preservation of the Scriptures in the apographs or copies (on this topic see the Reformed creeds like the Westminster Confession and Second London Baptist Confession ; John Owen, “Of the Divine Original of the Scriptures” and “Integrity and Purity of the Hebrew and Greek Texts” in Volume 16 of his Collected Works; Jakob Van Bruggen, The Ancient Text of the New Testament and The Future of the Bible; and more contemporary discussions from men like Theodore Letis and William Einwechter). There is little discussion or awareness expressed of arguments in favor of the AV and the traditional text from those who likewise reject a simplistic KJV-Only position (e.g., those made by the Trinitarian Bible Society). Thank you for your review. As a former IFBer (of the KJVO ilk), this book caused quite a stir when it was published. This book, and Central Baptist's "One Bible Only? ", were roundly condemned in the circles I was a part of. As the Lord was slowly (and graciously) drawing me out of that environment toward Reformed Theology, one thing that became apparent to me was that the Reformed doctrine of preservation in the apograph was both correct and the only position which one could defend cogently, if one were going to claim TR/Byz priority. I, like you, was disappointed that the book reviewed did not address this issue.